Located in Brewton, Alabama and serving Escambia County and the surrounding areas, the Law Office of Jeremy L. Hawsey offers experienced legal representation in family law, personal injury, estate and probate law, and criminal defense. Mr. Hawsey and his staff understand the stress and heartache associated with many legal problems people face, and his goal is to handle each case with discretion and competent analysis of the legal issues to allow his clients to achieve the best possible outcome to their legal matter. Jeremy has lived the majority of his life in Escambia County, Alabama. After graduating from Flomaton High School, he attended Jefferson Davis Community College on an Honor’s Scholarship before completing his Bachelor of Arts at Auburn University. He went on to complete the degree of Juris Doctor at the Birmingham School of Law and was admitted to practice law in Alabama in 2006. He then moved back to this area and now has over 10 years of experience in Criminal Defense, Family Law, Personal Injury, and Probate matters. After graduating and passing the bar in 2006, Jeremy became an associate at the firm of Earnest Ray White, Attorney at Law. In 2010, Jeremy began a solo practice and opened an office in Brewton, Alabama, where he has been practicing law ever since. 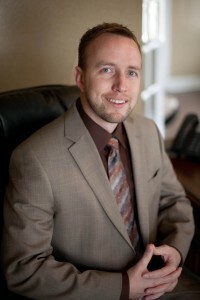 Jeremy also handles cases in the counties of Baldwin, Conecuh, Covington, and Monroe. Jeremy is a member of the Alabama State Bar, the Alabama State Bar Volunteer Lawyer’s Program, the Escambia County Bar, and the Tribal Court Bar for the Poarch Creek Indians of Atmore, Alabama. My office is on the second floor of the main Trustmark Bank building on Belleville Avenue, across from the Escambia County Courthouse. The easiest path to my office is to park on the side of the building and use the double doors on the side entrance, go to the elevator just a few steps beyond the door, and turn left as you step off the elevator. If you would prefer not to go in the bank, there is a door on the front of the building to the left of the Trustmark Bank lobby entrance. If you use this entrance, you will climb the stairs and walk down a long hall, taking a right and then a left to arrive at my door. There are signs to direct you. No representation is made that the quality of legal services to be performed is greater than the quality of legal services performed by other lawyers. All material on this website, including photographs, text, code and/or documents are protected by international copyright and trademark laws. Please note that an attorney-client relationship is not formed by submitting information via this website. Designed by MageeWP Themes.